Shotts prison was built in 2012 and is a prison for long term adult male offenders with a capacity of 553. The prison is situated in countryside south of the M8 motorway near the Lanarkshire village of Shotts. The prison seeks to provide a secure, safe, caring and productive environment, while providing opportunities for offenders to come to terms with their sentences and address their offending behaviour. Shotts also houses the National Integration Centre (NIC) within its boundary. The NIC holds approximately 60 adult male offenders who are in the initial stages of sentences of eight years or over and prepares them for eventual movement to mainstream prisons. It provides a supportive regime for those sentenced to life or eight years or over during the first six to nine months of their sentences. The original prison, purpose built in 1978, catered for long term male offenders (sentences of 4 years & over) who are transferred from other prisons and who require to be kept secure conditions. The prison was extended in 1987 and has since been completely rebuilt on the same site. Family Contact Officer 01501 824 032 (FCO - The phone is not staffed at all times during the day, but there is an answer machine service so please leave your name and contact details and we will get back to you as soon as possible). All offenders book their own visits and have the responsibility to inform their visitors of the day and time of the visit. Below is a list of identification requirements, the times of visits session, depending on the location of the offender, facilities and what you can expect coming to the prison. To gain access to the establishment for the purpose of visiting, you must have two forms of identification, one of which must be photographic ID. Entry to the prison will not be permitted without acceptable identification. All visitors are required to be at the Vestibule at least 15 mins prior to start of visit. If you are going to be late , please phone ahead on 01501 824000. Everyone must book in at the vestibule and the staff will log you in on the system. You can hand in money and property at this point. You will have to put all valuables in the lockers provided and you will not be allowed to take a wallet or purse into the visit room. Lockers take £1 which is refundable. All visitors will be asked to walk through a metal detector and may be given a rub down search by a member of staff. You will then have to climb a small flight of stairs to a secure waiting area; there is, also a lift available to any visitor who has problems accessing the waiting area via the stairs. At times, there may be the SPS Dog Unit working in the visit area, it’s nothing to worry about and you will be given clear instructions from staff. If you have any concerns please feel free to talk to a member of staff. After a short time in the waiting room you will be allocated a specific numbered table in the visit room and allowed access to the main visit room. On Thursday, Friday and weekends there is a tea bar open which is run by the Friends Of The Samaritans and they provide hot and cold refreshments. Also there is a number of coined refreshment machines located around the visit room for use. There is always a FCO available for anyone wishing to speak to them throughout or after the visits. There are toilet facilities, including disabled toilets and baby changing facilities as well as a children’s soft play area which is located in the visit room. 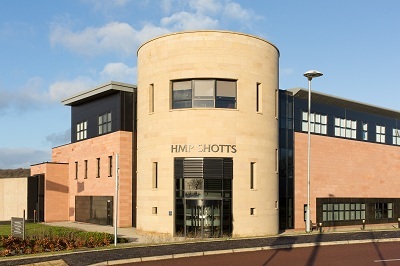 At Shotts we pride ourselves on making the visiting experience as relaxed and welcoming as possible with a supportive environment especially for first time visitors who are unsure of prison procedures. All visitors wishing to hand in property to a offender will be required to provide photographic identification and documentary evidence supporting proof of name and address (see visiting guidelines above for acceptable forms of identification). All property and cash is posted at the senders own risk. All property must be accompanied with a valid pro-forma. Only one pro-forma per parcel.